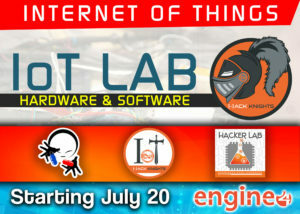 IoT Hacks Knights – Starting July 20, Hackers of Software and Hardware bi-weekly every Thursday at night in ENGINE-4. This is for talented people of all universities; Graduates and Non-Graduates, get together and will be able to create and learn how to do IoT devices and with expert programmers to bring those devices to your reality. Creating challenges in that way, can also be prepared for the Bayamón Smart City IoT Hackathon. Hours from 6:30 pm to 9:00 pm Thursdays every two week.